During the return motion of the barrel and bolt, the effect of the action of the accelerating lever is to transfer kinetic energy from the bolt to the barrel, thus gradually slowing the motion of the bolt and accelerating the motion of the barrel. This action has the beneficial effect of greatly reducing the shock which would occur if the bolt, which is returning at high velocity, merely collided with the rear face of the barrel. 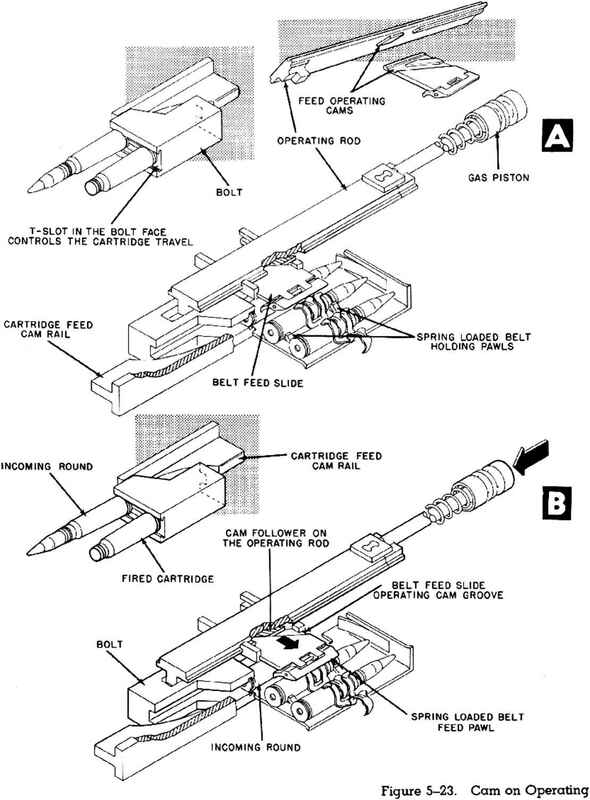 The analysis of the motion of the barrel and bolt during the action of the accelerating lever in counter-recoil is considerably more complicated than for recoil. This is because of the fact that the lever has already been designed and the velocity of the barrel or bolt can no longer be selected as desired but will be determined by the characteristics of the lever. Initial KE+Work done by springs—Energy losses=Barrel KE+Bolt KE.